I am 37 years old and I am experiencing an early stage of Rheumatoid Arthritis. Are you familiar with this illness? 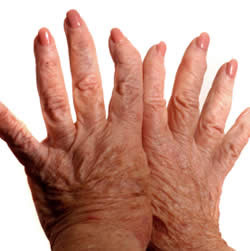 Rheumatoid Arthritis also known as RA is caused by inflammation of the lining of the joints. One of the unique features of this disease is that, it involves the small joints of the hands, wrists, fingers and feet . Then, other joints that will be affected are hips, knees, ankles, neck , elbows and shoulders. According to a study, the pain is symmetrical in aspect such as if it affects the third finger on the left hand, usually will also affect the same finger on the right hand. I felt this symptoms in my toes and usually the pain is very excruciating. Can this be cured? No, but, with the right treatment, the disease is manageable. Understanding this disease helped me to live healthy and take care of my body. Rheumatoid Arthritis is systemic inflammatory disease that causes pain, stiffness, swelling, and loss of motion in the joints. The immune system attacks body tissues such as synovium, which is the tissue that lines the joints. This causes an inflammation that can eventually lead to the destruction of the synovium and the joint. This disease is common to women ages 30 to 50. There are treatments available to relieve the pain, improve mobility and slow down or even stop damage to the joints. First, modifying lifestyle through regular exercise, physical therapies and eating healthy diet. These treatments are easy, common and would eventually work. It all depends on the person's determination though. Taking medications such as non-steroidal anti-inflammatory drugs, steroids, disease-modifying anti-rheumatic drugs are good suggestive treatments for some people who don't have the patience to do physical workout. Do not take any of these drugs with out consulting your doctor. If it is causing so much pain, you can have surgery to repair damaged joints. But if alternative therapies such as acupuncture or massage will help to stop the pain, have that treatment anyway. How does it affect ? RA can cause significant joint damage and deformity if not treated right away. It can cause the fingers to bend toward the little finger; abnormal bending and straightening of the fingers; deformity in which the fingertip is curled in and cannot straighten itself, inability to bend the wrist up or down due to inflammation or cause the fingers to lock in unusual positions as the person tries to bend them. These are the problems usually occurs in the hands area. Knowing how it will affect a person, treatment should not be taken for granted. As for me, if I will not treat this seriously, I would suffer Hammer toes of which changes in the tissues around the toe joints can cause abnormal bending; Bunions of which joints of the big toe causes to bend toward the little toe and develop a bony nodule; Pes planus, the loosening of the arch joint in the middle of the foot, which causes a painful flat foot; Valgus hind foot, the loosening of the joint below the ankle, which causes the foot to bend outward. Then, generally problems in walking caused by pain in the toes and other deformities. Serious? It is indeed. It may progress slowly or quickly. If the disease progresses, joint pain can restrict simple movements such as ability to grip, daily activities and climbing stairs will be affected. Sometimes this disease usually progress gradually. Disease-modifying drugs usually given within 3 months of the diagnosis and are used to control the progression of rheumatoid arthritis and to try to prevent joint deterioration and disability. Currently, the treatment that I am pursuing is doing my daily exercise, healthy diet and relax my mind from all stress around. Physically, I am doing good because I seldom feel the symptoms which I am so thankful about. My mentally and emotionally, my worries are with me all the time knowing how serious this would progress if I stop taking care of my health. Talking about the RA Medication Ads really helps people who have this kind of disease. It builds up confidence that someday, there will be cure of this illness. Pharmaceutical companies play a vital role in Medical Institution. With their constant research in finding cure to illnesses, the society have high hopes that we can fight diseases and live healthy. According to those people who had taken Enbrel medication, it helped them a lot. They become active, get their life back to normal, effective and no side effect whatsoever. I like the fact that RA medications augment the life of people who have this RA disease.
" Get back your life. Take this drug treatment now"
Learning the symptoms, act appropriately and have positive attitude with life keeps me going. Eat healthy and live happy everyone.